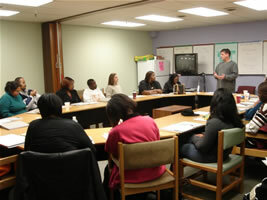 The Arc’s training department offers certification and re-certification courses for residential and vocational staff. Scheduling can be made by contacting Rick at (856) 764-9494. We provide certification for Standard First Aid, Adult CPR, Child CPR, Infant CPR and Professional Rescue CPR (through The American Red Cross); Overview of Developmental Disabilities, Preventing Abuse & Neglect, and Medications; OSHA, Sexual Harassment, Basic Behavioral Management, Features of Mental Illness, Crisis Recognition and De-escalation, Lifting Techniques, IHP, and Danielle’s Law.